These Powerful Les Brown Quotes Are Sure To Help You Choose the Path That’s Right for You and Propel You Toward Success! I first met Les Brown in 1987. Les and I were both just starting out on our journeys to grow our work in the world. Together, with another man who was doing the same, we were invited to work with a mentor named Jack Boland. Jack taught many, many people over the course of his lifetime, but he mentored only three: Les Brown, Wayne Dyer and me. And during this period of mentorship, a friendship began among the three of us as we grew and supported each other, both in our careers and in life. Our friendship has lasted many decades, and like many of us, I’m inspired by the thoughts and words of both men. Today, I’d love to share three of my favorite quotes by Les Brown. 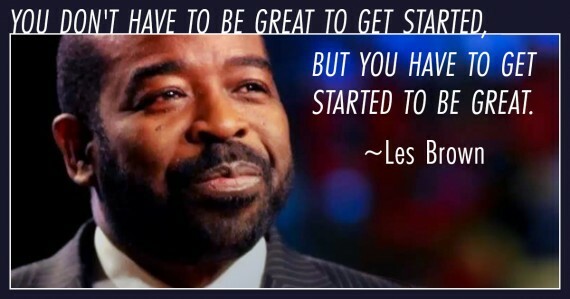 Les Brown not only is a great motivator, but he lives from the motivation he teaches. I’ve seen Les experience ups and downs over decades of life, just as we all do. It’s one thing to know some principles and to say great things, but it’s another thing to live them no matter what life tosses your way. Watch Les Brown Live This Saturday! I’m hosting Les Brown, Bob Proctor and other special guests on the can’t-miss DreamBuilder Summit. So, when you hear the words today that are three of my favorite quotes from Les Brown, know that he not only knows these things, but he actually lives them. And I know by hearing them, it could make a difference for you, too. You may have had someone tell you that you’re never going to be a great singer or you’re not college material or something along those lines. I think that one of the biggest pieces of advice anyone could ever give is to never let someone else’s opinion become your reality. Instead, if anyone ever doubts your abilities, simply ask yourself, what would I love? And then go for it! You take the five people you hang out with most. Then average their happiness, fulfillment and income. What you’ll find is that you all have about the same level of happiness, fulfillment and you all earn about the same amount of money. This is because what you think creates your experience and people who hang out together usually think and talk about the same things and in the same way. So, hang out with people who are growing. Hang out with people who have goals, and who are committed to growing and developing everyday for the rest of their lives. When I think back to that office where I met Les and Wayne back in 1987, I remember that neither of us had done much of what we could call great work in the world. But we made a commitment to start anyway, and Les’ words ring true. So what would you love to have or change in your life? You don’t have to be great at it right now to get started. But you do have to get started to be great. I want to give thanks for Les Brown, his work in the world, his presence and all the difference he’s made being on our planet. And what I’d absolutely love is for you to take in these three quotes today and make use of them in your own life. Out of the three quotes I shared with you, which one is your favorite? Go ahead and share your thoughts with me in the comments section below. AND! If you’d love more inspiration, and to discover how to overcome limiting thoughts and patterns in order to attract and enjoy greater abundance and joy in all areas of your life ‒ then get ready to register for a can’t-miss free online summit happening THIS SATURDAY! Join Les Brown, Bob Proctor and other special guests for a free, live event called DreamBuilder Summit. Produto não faz parte de um programa de emagrecimento. You don’t have to be great to get started,but you have to start to be great. I do believe that we need to hang around dream builders. I love life and people and NEED to be around people that lift me up and love life! I like all three quotes & thank you for sharing. 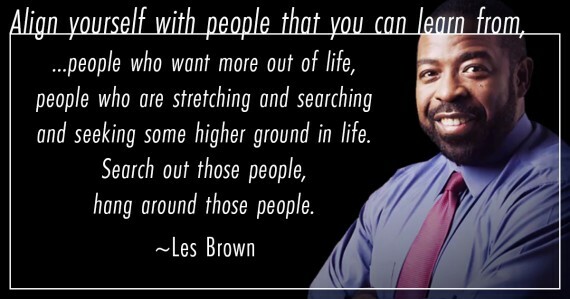 Les Brown is on of my favorite motivators too. So true dear Les about alignment. It’s part of my struggle as my intent is to share and give. I appreciate all 3 quotes! The one most powerful is not letting other people’s opinion of me determine my reality. I’m 47 years young but have lived under the opinions of others most of my life. I’m ready to fulfill God’s purpose for me! You don’t have to be great to get started. But you have to get started to be great. I love don’t let someone else’s opinion become your reality. This has been a theme for me this year. It felt like a fog of gaslighting. All the limitations and perceptions weren’t even my own. I was told things for someone else’s desires and limitations. The more I believed it the more proof I found. I’m waking up now. 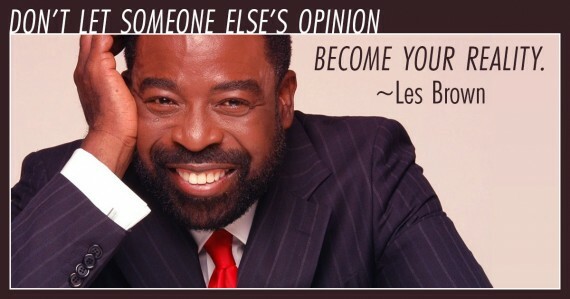 But,there is a profound insight in Les Brown’s quote. Thank you for sharing this. The first quote is absolutely the most important one.There is no real change or growth without it. The second one is very difficult to do because we tend to be very loyal to friends and family. If I check who I hang out with most I should probably run away at once. Yet I have the biggest trouble with the third one, as I often start but then stop again. BUT here is the catch: These quotes show a way of building up the right energy for change, so you cannot do the third one right if you are not good at the second one, and cannot manage the second one if you are not good enough already at the first one…. Hi thanks so much for sending me these little quotes, through my email, they seem to come when I need them. I am starting a new venture, it is a new food van, I am a little nervous exited and oh so scared, but just reading this little quote about “you don’t have to be great to get started, But you have get started to be great, so true, I love creating and craft up cycling, so doing food van, is a different way to create something new and enjoyable. , so this is my new journey , so will keep you posted. kind regards Dee. My favorite: You have to get started. . .
You are a powerful presence. Great advice, but cannot watch tomorrow. I will be driving out of town. Feeling my loss. My fav: “Don’t let someone else’s opinion become your reality. My alcoholism, stiffness and ills, I have come to believe, were the result of hanging on too tightly to what others thought of me. I am learning to care for myself and to embrace the choices I’m making. As a result, my body is repairing itself. I love the miracle of being me! Wow! Thank you! Perfect Timing!! I am aspiring to be a Teamleader in our company and I’m just waiting for the schedule interview. Reading this quotes make me believe on myself more, that I can handle this and I can do it.. It was very aspirin. Thank you so much! Outstanding and something I live by everyday! His first and third quotes, as you’ve listed them, are a tie for me. I’ve always been especially sensitive, so whenever I was criticized, I took it to heart. Sadly, I allowed other peoples’ opinions to become my reality and all it did was hurt me severly. Now, decades later, I am reconditioning my subconscious through subliminals, journaling, and whatever else is necessary to improve my mindset. The third quote resonates for me because my analytical mind and need to understand before I proceed has killed many an opportunity that, I’m sure, had I just moved forward regardless, I would be a lot further in life today. Implementing ideas and taking action is what I know is a weakness and in grave need for change. Thank you, Mary, for your post. Great quotes and both Les Brown and Wayne Dyer are also favorites of mine. Many thanks and God bless. I love the 2nd quote about aligning yourself with people you can learn from! Conscious Evolution is our calling….. see what you love reflected in others…reflect it back. Thanks for the upbeat Inspiration ! Don’t let someonelse opinion resonates with me. Thank you Mary. Align yourself with people you can learn from rings true to me today. I think if we are aware we can learn from everyone but to put yourself amongst greatness and growth is another thing altogether. I am trying to do that right now. Much love and light to you. I love your quote about not letting others define who you are. I tell this to my teen age grand daughters all the time. You are not what people say you are you are you a strong independent young woman. Don’t ket ither people’s opinion become yiur reality. Infact, I loved all 3 quotes. Both of the above should be embraced. I love to sing Jazz offer soul healing sound healing and I love to dance in my own way. I study with Master Zhi Gang Sha. I am an out of the bento box kind of person.I want to sing and move as I teach and lead practices to inspire others to open hearts and souls into Heaven’s presence and Treasures here on Mother Earth . Why? I stuck in one place because of people opinions. I am 45 years of age, but have nothing on my name. My greatest quote was:you don’t have to be great to get started. But you do have to get started to be great. Thanks. I resonate with all 3 qoutes! 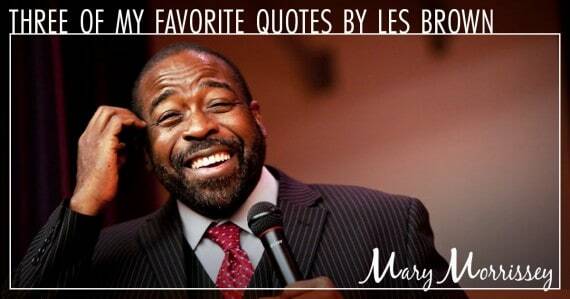 Thank you Mary for these three quotes from Les Brown – very inspiring and thought provoking! I was getting sober in 2003, when my dear sponsor kept reminding me that “other people’s opinions of me were none of my business.” She said it so often, that I swear, to this day some 15+ years later, I still hear her words in my sleep. But they were words that I needed to hear. I had allowed others to create my reality. Getting sober allowed me to claim responsibility for my life, including owning my own reality. Even today, I can get caught in the trap of giving others power over me, letting their opinions count when I ought to be looking for my own direction. Then her words come back to me again. Ghandi’s words are indeed true. I must be the change I wish to see in the world. Recovery has taught me that. Sadly, I don’t think I would have discovered this valuable truth any other way, save for the difficult path I have chose to walk. Since 2003, I’ve discovered that living with addiction or mental illness or abuse or poverty or any number of limiting conditions can put one in that same mind set. I’ve listened to many stories. Whether in 12 step meetings, mental health groups or Bible study with “regular folks” or just in the conversations I’ve had in supermarket check-out lines, our stories are human stories, dialogues of the heart and the of the voices we hear within, the voices that guide us whether we know it or not are part of the human experience. It’s reassuring to know I’m not alone or unique or somehow absurdly susceptible to this phenomenon. It’s heartening to see so many seeking their own way, their own path. I still have far too many opinions of others buried deep inside to expel but the most obvious sources of my insanity and discomfort have been challenged and are challenged daily. I no longer live to serve the whims of others, but rather to honor my core values and beliefs. It is a far more fulfilling life. And it’s always good to know that there are more challenges ahead. What would life be without something exciting to keep me going? Thanks for the Quotes, my sentiments exactly.I know my passion, it’s just getting the funds & resources to get started, and how to start. I do love the quotes and I’m sharing with my daughter.. I loved the quote , “ don’t let someone else’s opinion become your reality” I made a huge career shift last year and started a Wellness program for youth with my sister -Everyone thought I had flipped my lid for taking early retirement and starting a business promoting wellness for youth. I have never been happier in my life!!!! Personally I liked # 3 the most. However all are great. Thank you very much for the inspiration! Your timing was impeccable ! I’m approaching the end of a long season recovering from a traumatic event the changed my life, my energy, my motivation, and my view of the world around me. I have said that my get-up-and-go got up and went but sometimes action comes before motivation and I am ready for action and it is people like you that will make that possible so thank you for taking the time to reach out and know that you are appreciated! You don’t have to be great to get started.but you have to get started to be great. As I see it, Life is a continual opportunity to grow and learn – So when we are in the presence of those who are positive and uplifting, it helps to strengthen our possibilities of growing towards a higher place of life. will there be a replay as I am busy that whole day? Tough to decide which one is my fave…all 3 kind of go hand in hand sooo… if I had to pick one it would be “don’t let someone else’s opinion become your reality” because I think that’s really where the wake up call is!!! The other 2 are somewhat of a progression from the wake up call. Thank you for sharing this info. I too have been an avid follower of Les Brown for many years and did have the chance to see him in person last year when he came to Anaheim.. The last quote that,you don’t need to be great to start rather to start to be great..this is my favourite. And actually ithink theres’ great sense in what les was trying to convey,that to encourage the start up not to look on their not haves rather what can be achieved/accomplished,not what is missing rather what i have to do now with what i have to achieve great massive things. Well,since you spoke about how you guys met and sharing your success journey,wish could have the mentor like you and les brown. If you will find it convenient to you and take me in, i ‘ll be glad. I like the first quote: “Don’t let someone else’s opinion become your reality.” Ironically, I’ve used a similar motivator, I say: “Don’t let anyone ‘should’ on your life.” Family, and some friends and co-workers are really good about telling you what you should and should not do with your life. I’ve always thought was great. Miss hearing from him! Thank you for sharing your truth and how you got started!